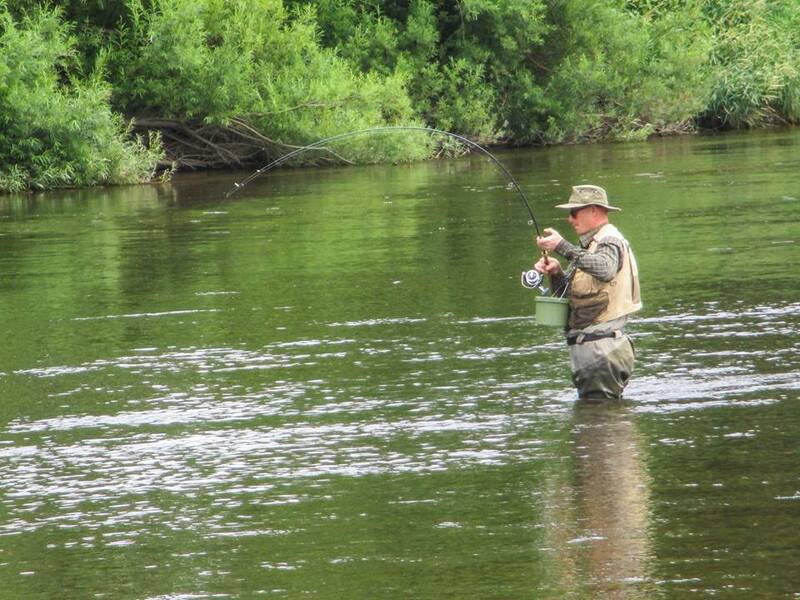 A return to the Wye is always something to look forward to. Generally the fishing is good and certainly the views are worth the trip, even if the fishing is a bit lackluster. There are always good opportunities to spot plenty of wildlife, particularly bird-life, so pack your copy of the RSPB Handbook of British Birds and you’ll be crossing off all sorts of species from the list. We often spot plenty of deer too and there are always a few rabbits or hares to add to the mix. The strange thing is I don’t think I’ve ever seen a fox in the Wye Valley but there must be a few I’m guessing. This particular trip was made with Danny and Pete. 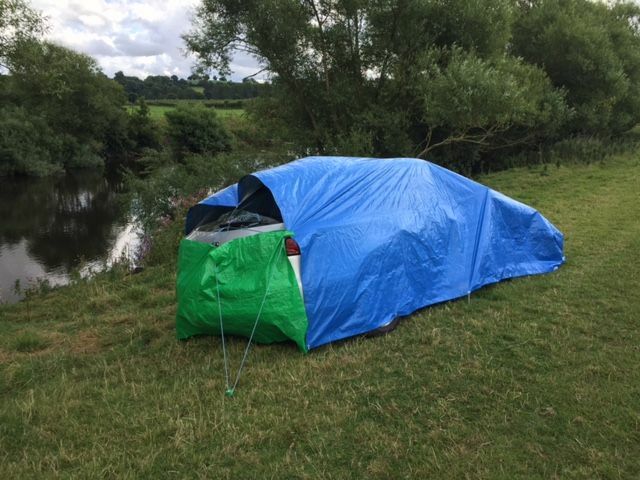 We were heading to Hereford for a couple of days, hoping to find the river in good sorts. It’s been very dry over recent weeks and the river was actually quite low and clear. At least that gives me an opportunity to get into the water and explore some swims. 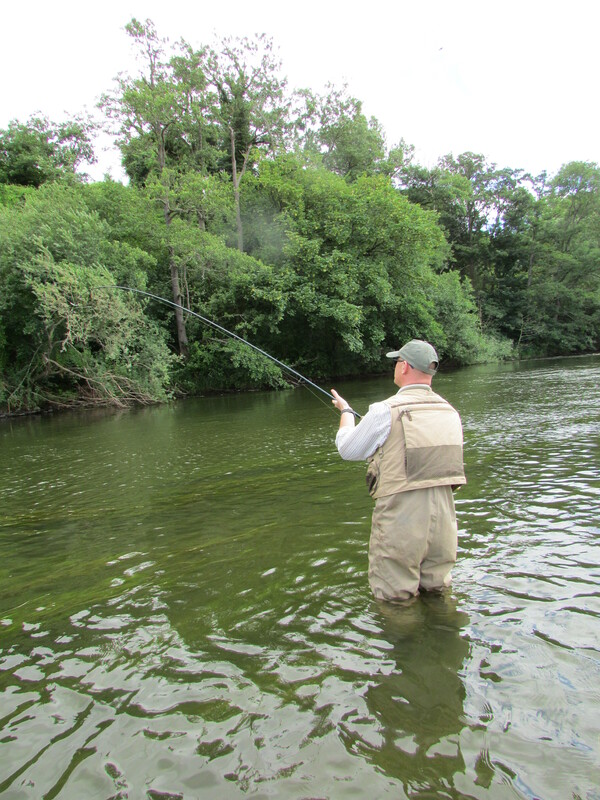 The breathable chest waders means I don’t sweat my whatsits off in these hot, dry summer days. You can buy some reasonable breathable chest waders now pretty cheaply and they are definitely worth the money. Avoid the neoprene waders in the summer at all cost. They are hard work and you’ll be soaked through with sweat. The two guys found their chosen spots and I headed off to a lower section where I could get the waders on and get out into the river. I waded out with some 6mm and 8mm caviar pellets. The idea was to put some loose feed out and watch and see what happens. I managed to reach a large slab of bedrock about mid river. The water was gin clear, there was barely a ripple on the water and the sun was out making fish spotting very easy. Obviously a pair of polarized sunglasses are essential to cut out the surface glare of the water and see clearly through to the the riverbed. Once out in the river I spotted a deeper cut in the bedrock in front of me. I noticed some chub up on the shallow bedrock just downstream. I fed out a couple of small handfuls of mixed caviar pellets and soon the chub were darting about chasing the loosefeed. I kept tricking in the pellets and soon a couple of barbel appeared, heads down, tails up feeding on the bait. After 15 minutes there was a healthy mixture of barbel and chub in front of me, probably no more than 8-10 feet away. 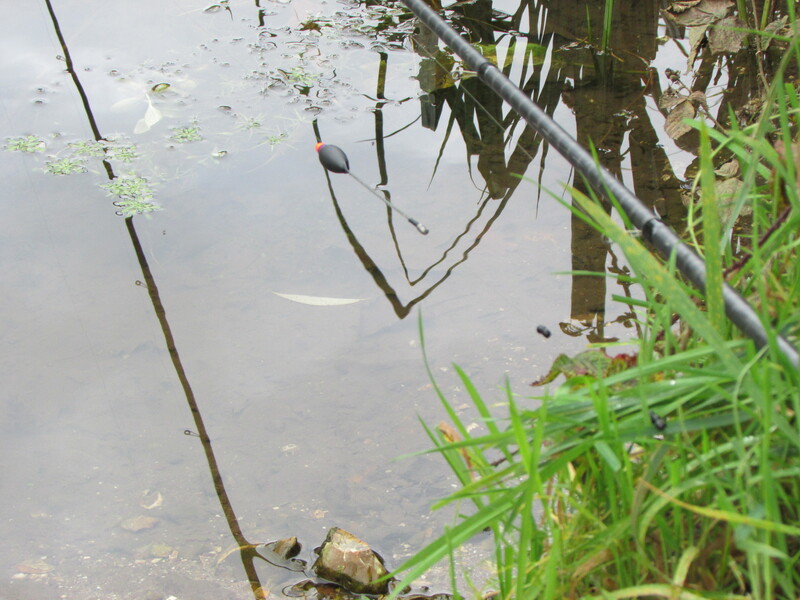 Visibility was perfect and I could see unhindered the fish reacting to the introduced pellets. I waded back to shore and grabbed a rod with a light feeder and a couple of 8mm pellets glued onto the hair. I swung the feeder out onto the adjacent lump of bedrock and threw out some more pellets. The barbel were soon hoovering up the bait and I could see my feeder in among the feeding fish. Suddenly the rod top wrapped round in a frenzied take from a barbel. 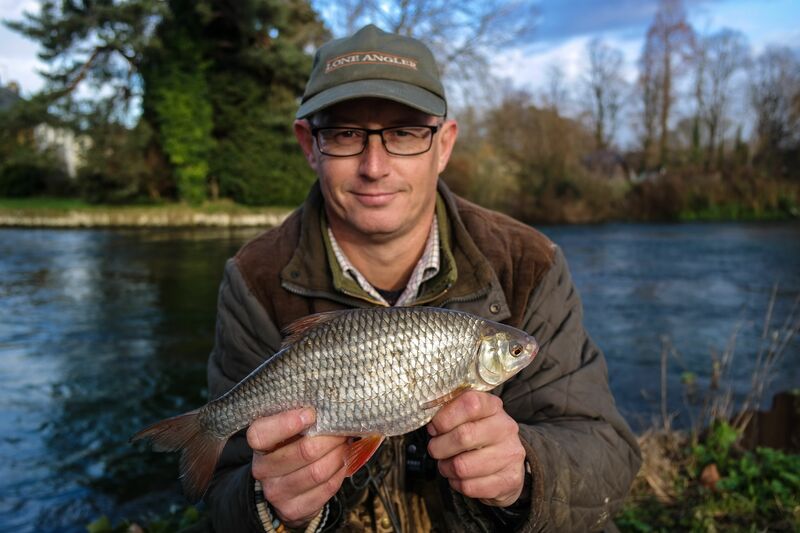 As I guided the fish to the waiting net, I could see the orange fins and the powerful tail kick, as the barbel surged off into the fast flowing river. After a few minutes I managed to net the fish and slipped the barbless hook out very quickly returning the fish to the flow. It powered off and disappeared among the bedrock. This was quite exciting fishing. There were plenty of chub darting around too, often taking the freebies as they hit the water surface. A couple of big chub followed that first barbel but then things went quiet. Around 5 or 6 yards away I could see the barbel flashing. I cast out a bit further and kept getting sharp knocks on the rod top but nothing really hittable. I swapped the feeder for a lead but that made no difference, the sharp bites kept coming. I tried a couple of the triple ssg shots and bounced a bait down among the rocks and that produced a couple more chub but the barbel were being very cautious. I decided to have a break and wondered up to see how Dan and Pete were getting on. It seemed things were pretty slow with them too. After a cuppa and a bite to eat, I left them to it again. I decided to wade out on top of the bedrock to around 3/4 of the way across. I now discovered a deep depression in the bedrock, which looked about 3 feet deep. I could see a number of chub and barbel stationed here and they seemed completely at ease with my presence. Again I fed some pellets and they were soon hoovering up the free offerings. I waded back, grabbed the rod and was soon in position again this time armed and dangerous! I swung out a feeder into this new spot and the rod top whacked over very quickly. 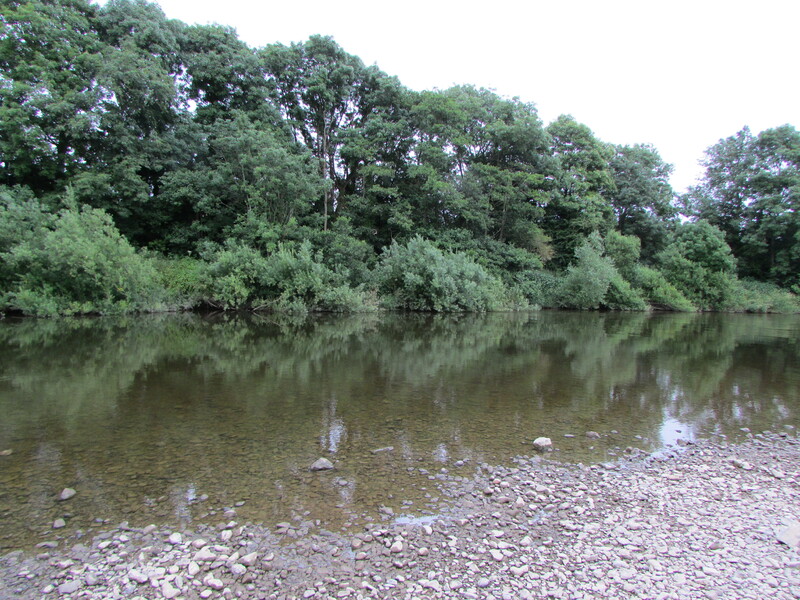 I managed to tempt 3 barbel from here and a couple more nice chub. Then the barbel moved out. I tried a few other spots but lost 2 barbel to hook-pulls and then the fishing completely died. The barbel seemed to be a bit wary or maybe they were just not feeding hard. I wouldn’t say they really spooked from the swim, even with a hook bait in place, so perhaps they just weren’t on it today. Nevertheless it had been a very interesting and educational day, watching the fish up close and how little they seemed afraid of my presence in the water. 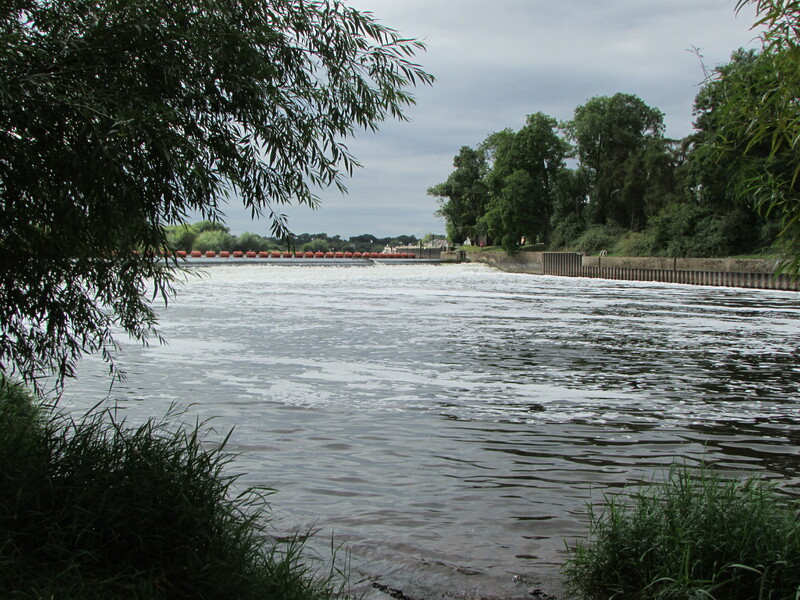 Hopefully I’ll be returning to the Wye soon but a more pressing engagement awaits; the mighty river Trent. 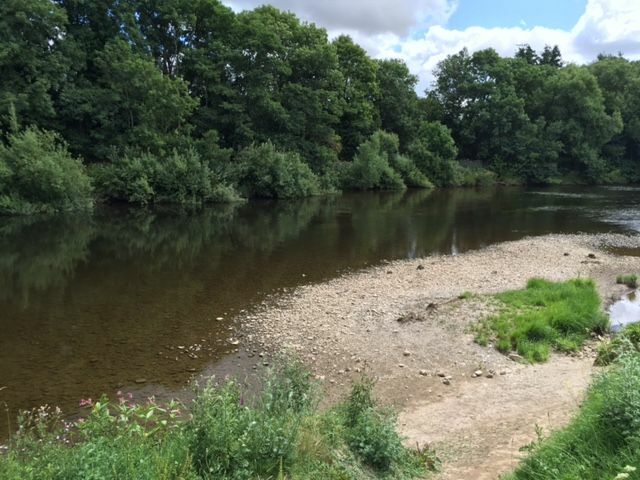 Day 4 of our Wye odyssey saw us back on a Wye and Usk beat and one that has produced big numbers of fish for us in the past. I headed to the cribs with fellow Lone Angler team mate Marcus Joy. Marcus was due to go home around lunchtime and I foolishly told him he’d have a few before he left, such was my confidence in the swim we were going to fish. Sadly no one told the fish! The swim is a beautiful gravel bend, which slowly shallows towards the far bank, with a deep run off of the crib. It looks perfect and screams barbel. I stuck to my usual tactics I had used for the week; a long coated braid hook link, 2 x 8mm pellets and a small hook. 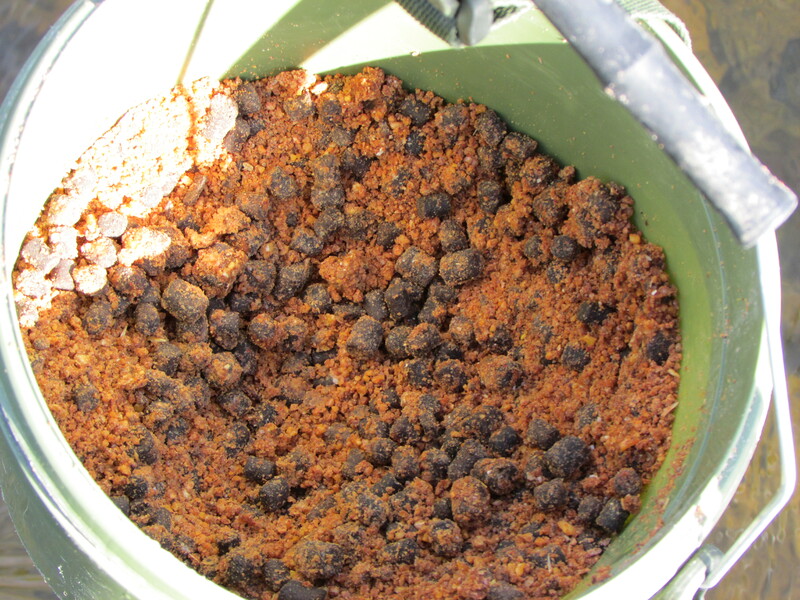 The feeder was packed with groundbait and lots of pellets and out it went. Marcus fished downstream and I fished upstream. We both kept trying different lines until we managed to connect with a barbel. By the time Marcus left around 2.30pm he’d had 2 and I had managed to bank 4 plus a couple of nice chub. Geoff then joined my on the crib for the remainder of the day. The fishing improved, particularly once i changed my hook to a size 14 barbless and used 2 x 6mm caviar pellets. I was now getting much more action. Geoff fished upstream and I fished downstream. Later on in the day Geoff noticed that every time his feeder dislodged and moved it elicited a bite. So I started to touch leger again and lift the rod tip occasionally to move the feeder. At one point I can honestly say as I lifted the rod, I felt the bait pop out of a barbels mouth, only for it to pounce on the bait once it moved. It certainly made for some exciting fishing. 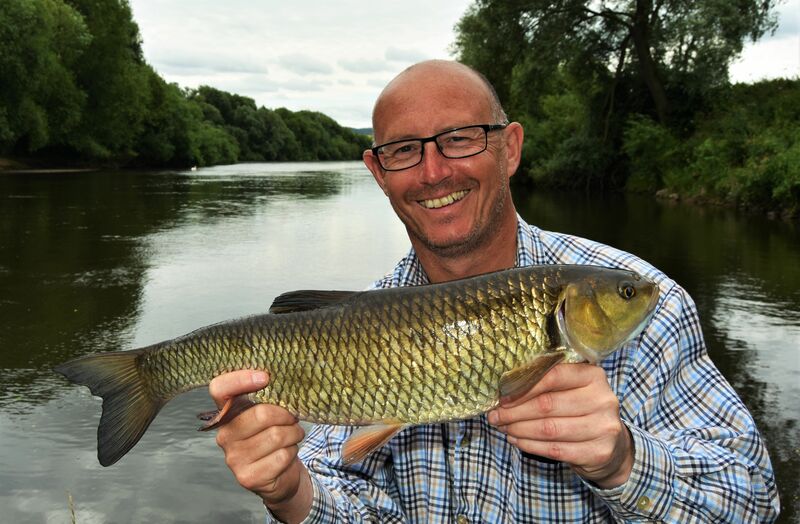 By the end of the day I had managed 14 barbel to just under 8lbs and quite a few chub to 4lb 4oz. Geoff finished on 12 for the day, although 4 of those were from further upstream. I now felt that the 6mm pellets would out fish larger baits, so on the last day that would be my tactics. We headed back to Hereford for our final session. Today was one of those red letter days you so often read about and think “why not me?”. 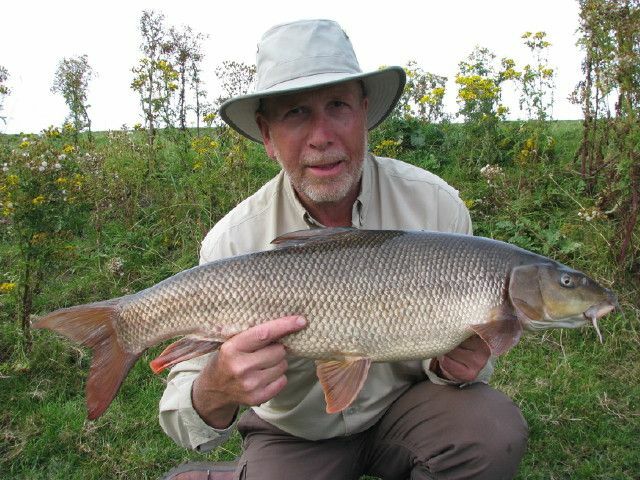 It was a bonanza catch of barbel and chub and right from the word go. Geoff and I started out sharing a swim. I fished upstream and Geoff down. My first cast produced almost instant results with a nice chub and then a baby barbel. 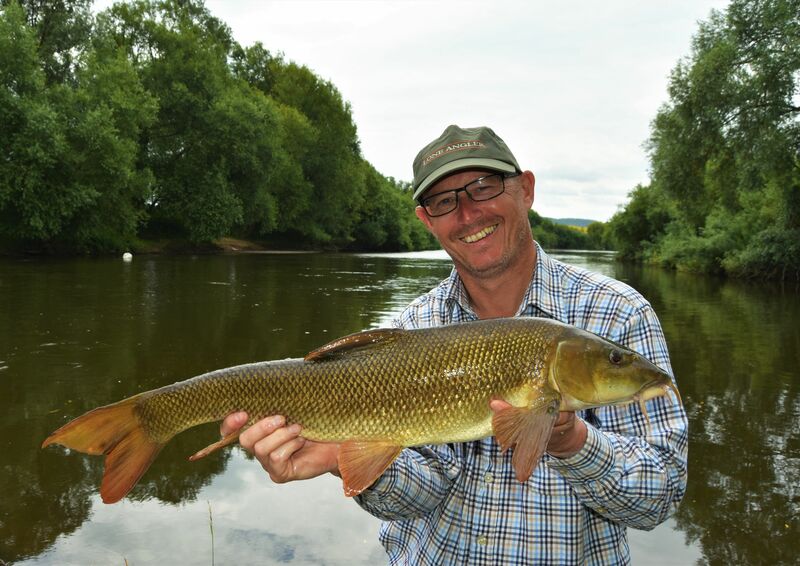 I love seeing these small barbel; they reaffirm how healthy the Wye is for fish stocks. 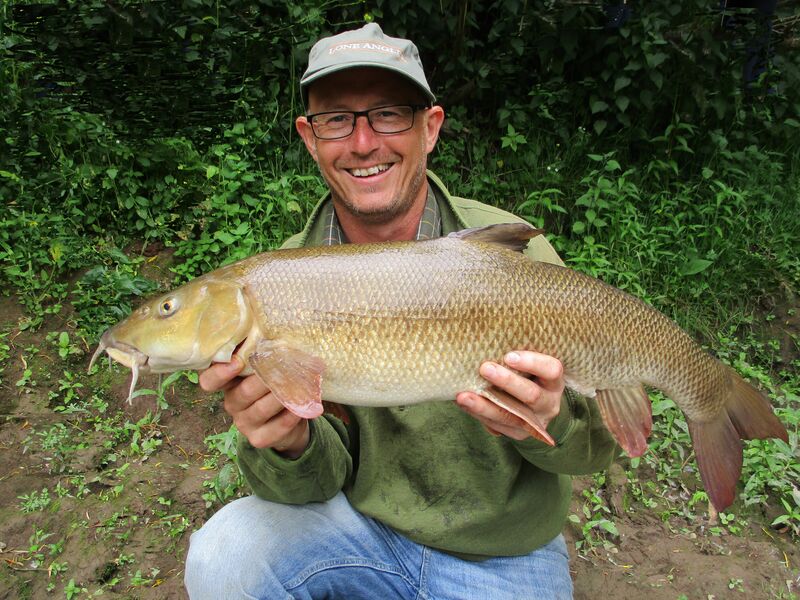 Soon I’d had 6 barbel including a stunning 9lb 2oz fish and chub to 4lb 11oz. At this point Geoff and I swapped places. He was now fishing upstream and me down. 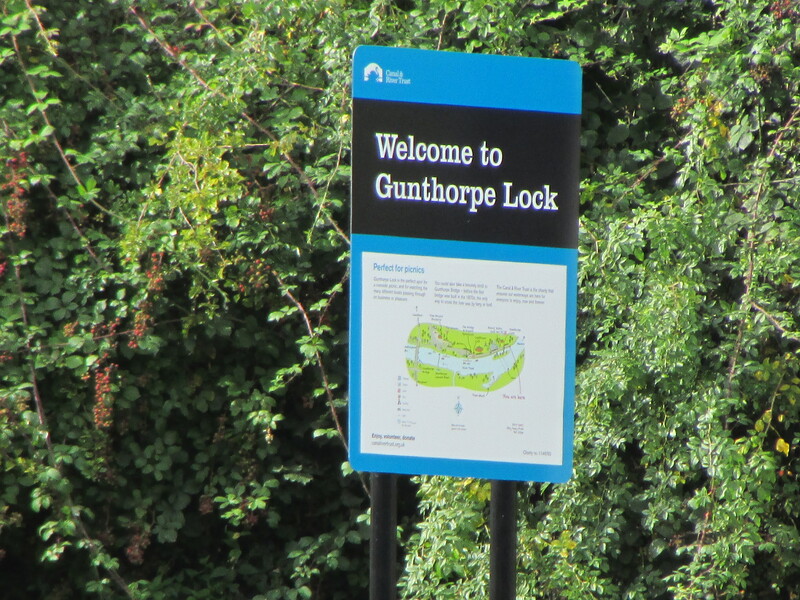 It made no difference to my catch rate and soon I was up to 13 barbel, whilst Geoff had taken 2. I think the small hookbaits were really paying off but I also believe the fish had become preoccupied on the caviar pellets. Geoff even cast back downstream in an effort to prove the point. No bites were forthcoming and yet my first cast back into position produced an instant bite. The power of the caviar strikes again. 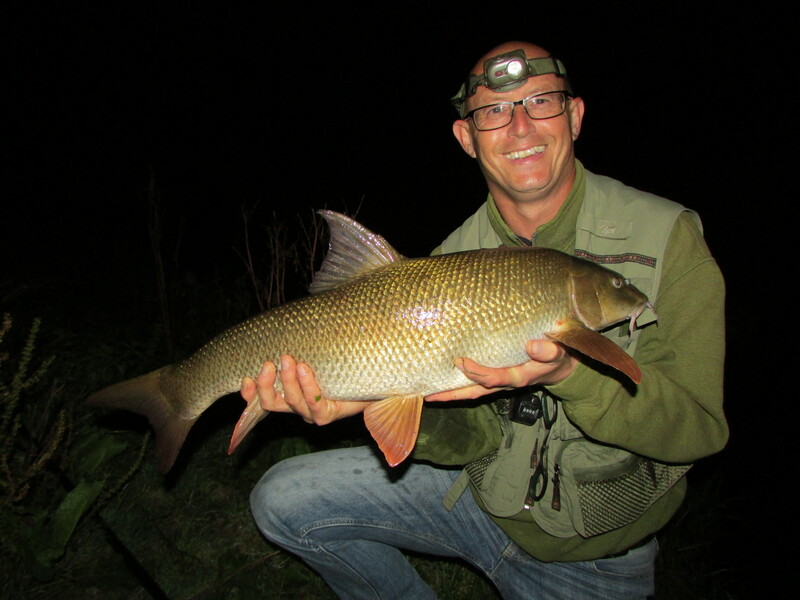 Geoff opted to move and ended the day on a creditable eight barbel but included a stunning fish of 10lb 3oz. 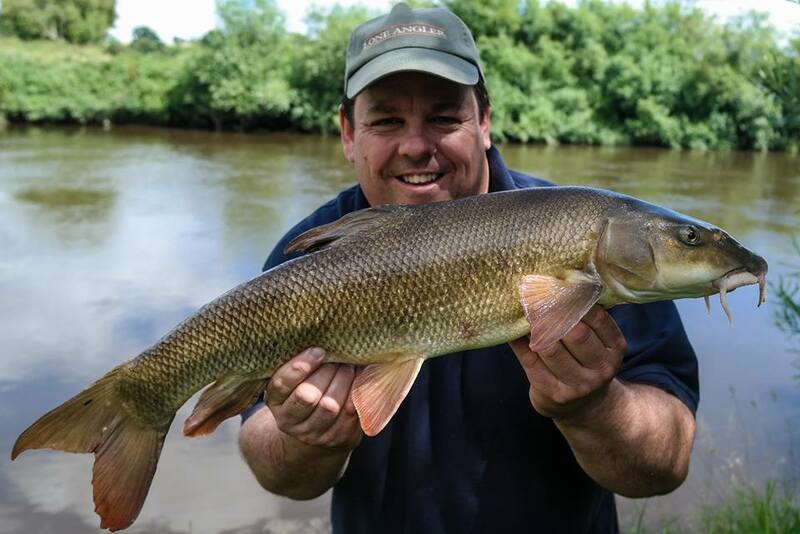 It was one of the nicest barbel I’ve seen and Geoff was over the moon. Meanwhile my action continued unabated. Every cast was met with whacks on the rod top. By now the swim was simply crawling with fish. Sadly as the day wore on and the fish just kept coming I ran out of groundbait and swapped to a straight lead. This certainly slowed up the results. However by the end of the day I’d managed to land a total of 31 barbel and probably 25-30 chub! I would say half of the barbel were 7lb plus and I had half a dozen chub over 4lbs. Unfortunately my biggest chub, which looked well over 5lbs, flipped back into the water whilst I was getting ready to weigh it! Still never mind. It was a day to remember and only the second time I’ve managed more than 30 barbel in a day. The fish were stunning as was the setting. It’s what makes the Wye the theatre of dreams. 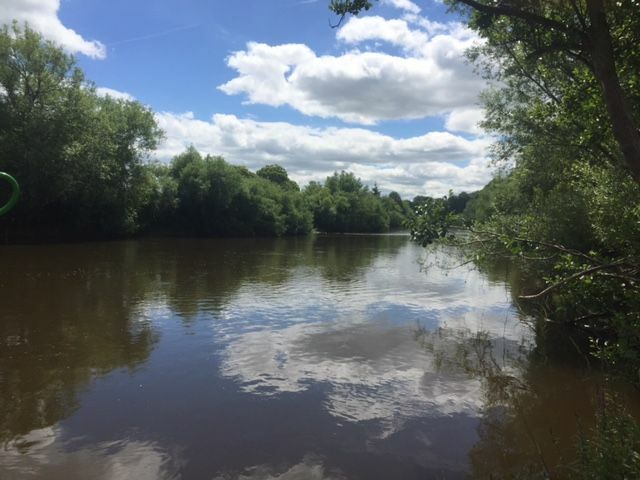 The start of a new river season usually involves a long awaited trip to the river Wye. Geoff, Kevin, Dan and I are normally raring to go by late June. This year was going to be a bit different. 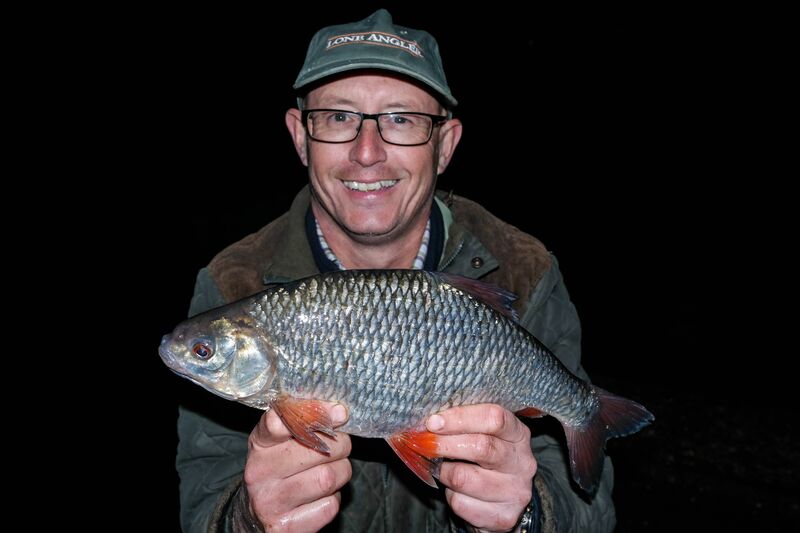 Jez Brown from Team Lone Angler had booked a week in a cottage near Hereford for the Lone Angler coarse fishing team and I was looking forward to getting together with the other team members. Due to the size of the cottage, Jez offered places to Geoff, Kevin and Dan and they duly accepted. 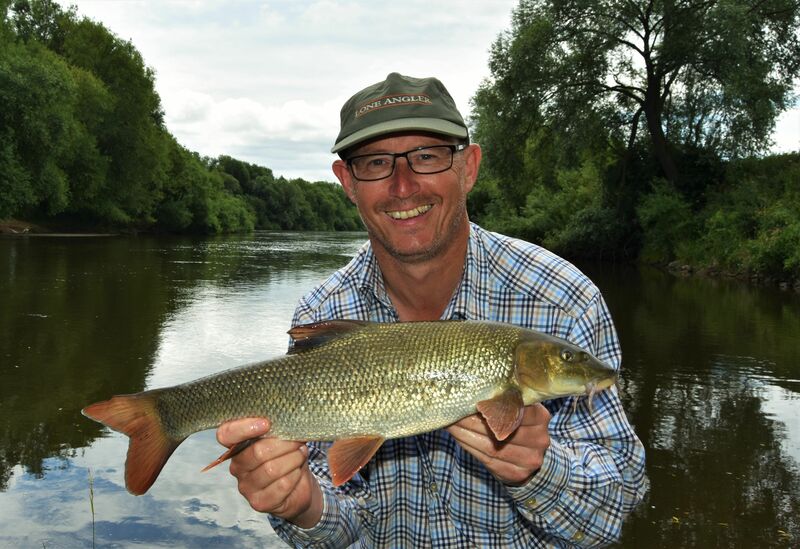 We were looking forward to some comfortable accommodation and hopefully some spectacular fishing on this great river. Sadly Kevin was unable to attend. His health has deteriorated recently to the point where he is unable to spend days out on the bank with us. The fishing isn’t the same without him and we all wish him a speedy recovery and hope the day will come when he can join us again. 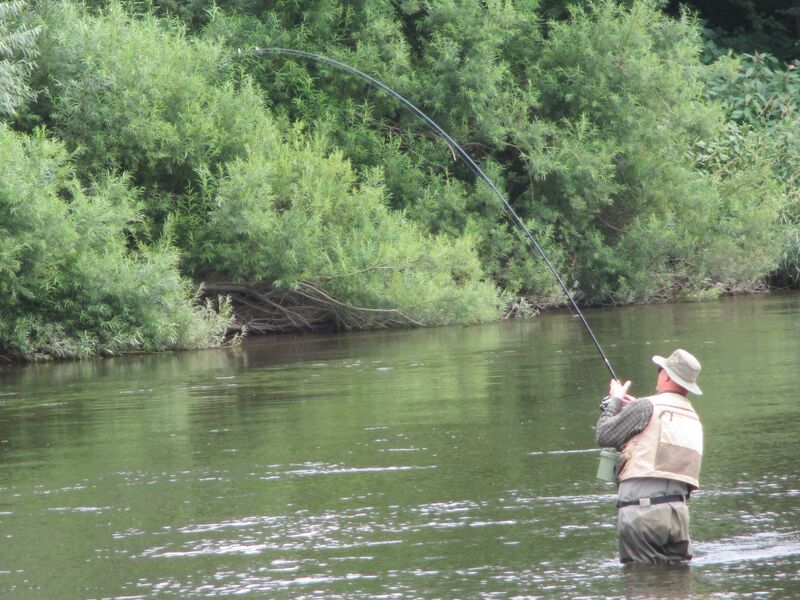 Jez had booked a number of Wye and Usk stretches and we also had a syndicate stretch near Hereford to fish. I was fishing with the LA lads Monday and Tuesday. For the remainder of the week I was due to fish with Geoff and Danny. As it turned out we had the whole of Wye Lea booked on the Tuesday, so they joined us there too. 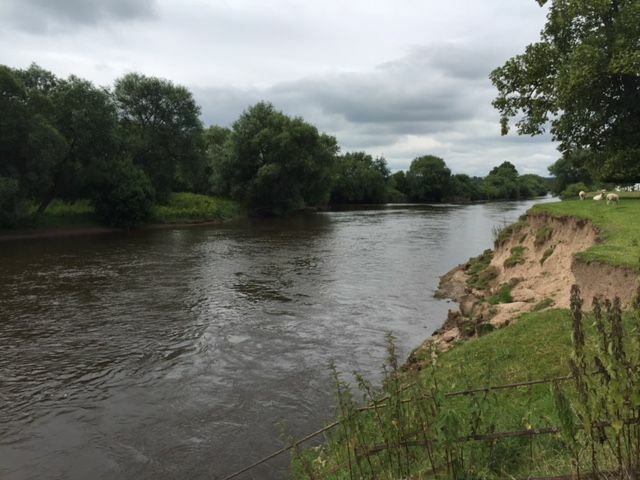 My first day started at the Creel, a Wye and Usk stretch. I hadn’t seen it before today. I arrived after visiting Morrison’s for a hearty breakfast and stocking up on a few provisions for the week. My tactics this week was to fish caviar pellets and to compliment that I was using the LA Ocean Pride groundbait packed with 6mm and 8mm caviars. The Wye level had been up the previous week but it had dropped quite a bit but still retained a touch of colour. Cage feeder were the order of the day and in the 3-4oz range would be perfect. I topped up at Woody’s in Hereford. His feeder are simply excellent and great value for money. They are also virtually indestructible too. Hook bait would be 2 x 12mm pellets but if things were slow I had 8mm or even 6mm to try. The fishing at the Creel was a little slow. I found a few nice spots. One was spoiled when 2 canoes moored opposite the island I was fishing to. 6 people got out and started a brew up and picnic right where I was almost casting too. I decided it was best to move, which was a shame as I had taken several nice chub and a couple of barbel. 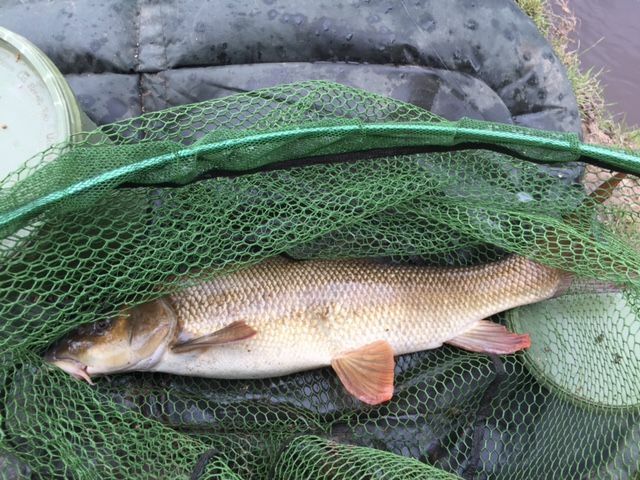 After a couple of moves I managed to sneak another barbel and a few more chub. I think the final tally was 9 chub and 3 barbel. I packed up and met Geoff and Dan at the KFC just outside Ross before attempting to find the cottage. Despite a road closure, we managed to find the cottage without too much bother. 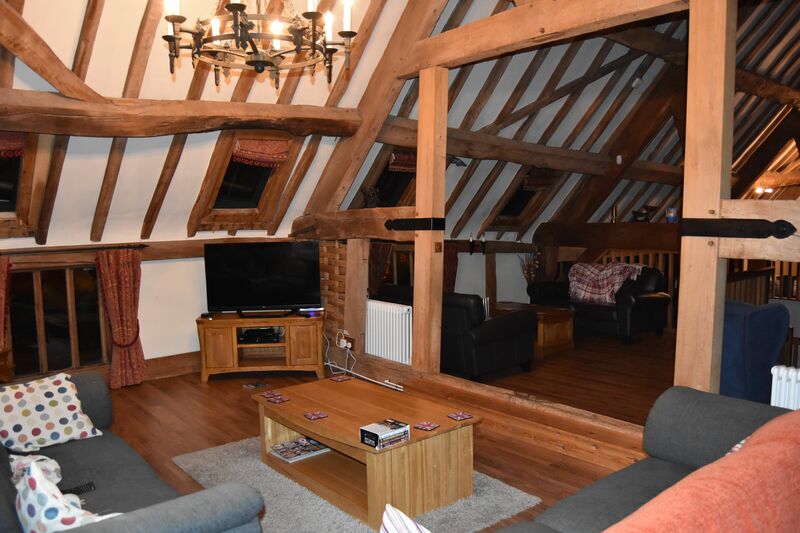 It was a magnificent barn conversion with 5 large bedrooms and a superb kitchen. It was a bit too luxurious for us lot but made a great base for the week. 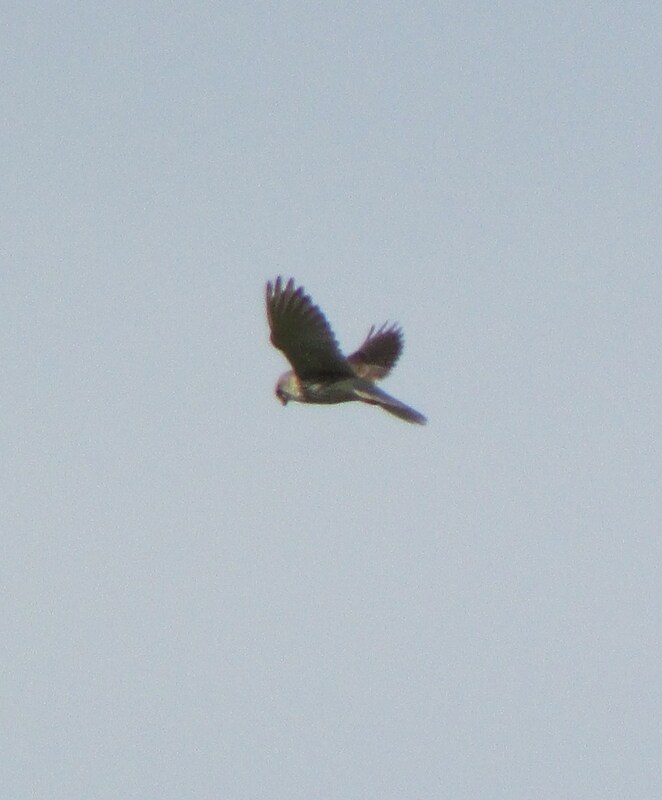 Day two saw us at Wye Lea. By now there was Mark Dutton, Jez and Rob Swindells, with Marcus Joy and Ray Pullford joining us later in the week. 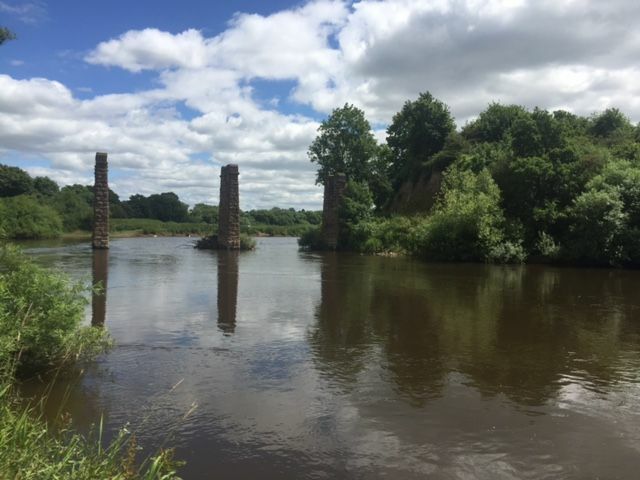 I opted to fish up by the old railway viaduct, fishing the fast water just downstream. A few chub put in an early appearance and 1 barbel. Mike the bailiff advised me to move right next to the bridge and after taking a look that’s exactly what I did. The barbel were somewhat elusive but again the chub seemed active. The day ended with 20 chub and 3 barbel. Geoff was top rod with 9 fish and the other all caught plenty of fish too. That night Mike O’Neill treated us to a fabulous meal at the Cottage of Content. A slap up meal of sirloin steak and a few pints made for a wonderful evening in great company. The landlady was, well, entertaining, I think! It was certainly memorable. I must say it’s the best steak I’ve had for a long time and I haven’t laughed that hard for while too. 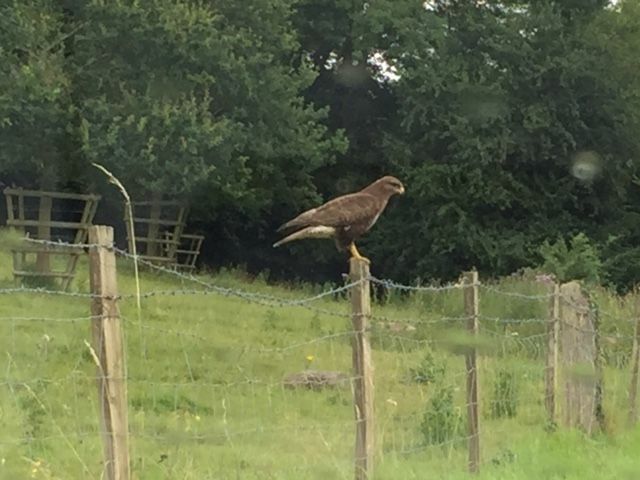 Day 3 saw us at a private stretch near Hereford. The river looked spot on, with a great flow and a touch of colour still. Geoff and Dan headed off to do their own thing downstream and I opted to start off at the top. The cows were in this field and there was a rather large and somewhat amorous bull present (and no I don’t mean me!). Cows can ruin your car’s paintwork (just ask Ray) if they lick it and they do, all over if left to it. So I had to keep one eye on the rod and one on the cows. After taking a lovely. mint conditioned chub from a deep run under a tree I noticed the cows were gathering. I opted to beat a hasty retreat and headed off to the lower section. 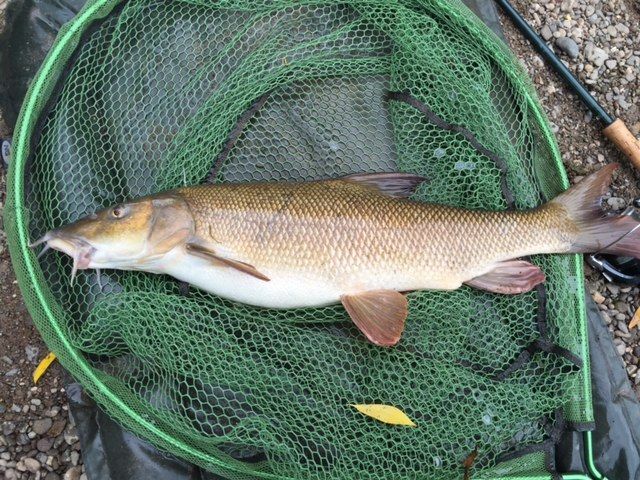 I found a nice swim in among some trees and within seconds hooked a barbel. Sadly it snagged me and the fish was lost. I then moved onto the beach. I decided to put on the chest waders and get into the water. It’s so much more rewarding to catch whilst in the water and seems more relaxing somehow. It was a perfect day weather wise; overcast and humid. My intention was to cast across to a deep run on the far bank, where there is an abundance of tree cover. 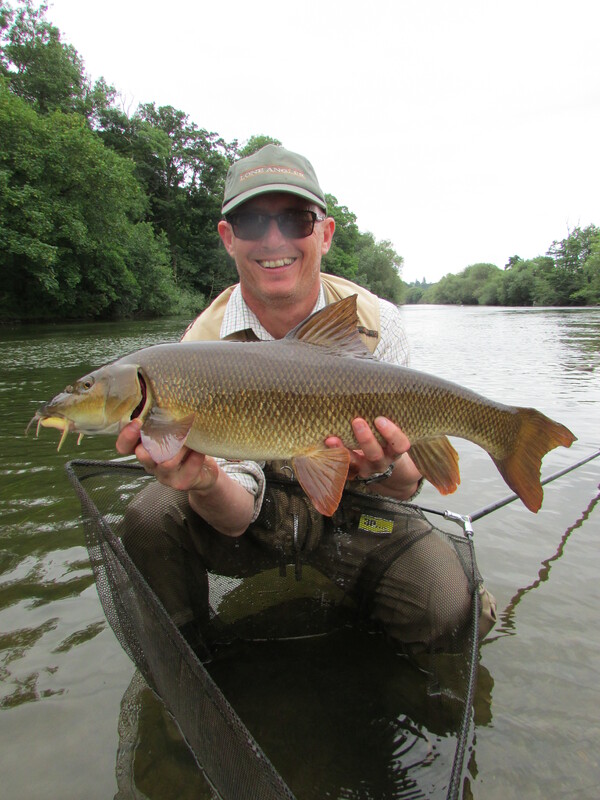 The barbel can be stacked up in here and the fishing can be explosive. I had opted to use 2 x 8mm caviars and a feeder packed with groundbait and pellets. I attached a strap to the groundbait bucket which meant I could fish effectively whilst wading. The fish could be unhooked in the water and released very quickly. If I latched into anything large I could simply wade back to shore and use the net. The first hour was a bit slow, just a couple of barbel and a few decent chub. I felt it should have been much better. I waded out a little further and decided to fish across a large sunken boulder and into an area just above the shallows. It would have been difficult casting from the bank to hear and even more difficult to extract the fish, due to the nature of the swim. Obviously I had to touch leger, which I love and soon the rod tip was pinging. I love it when that starts, as that’s a sure indication that fish are present. Soon the rod tip whacked round and a barbel was on. They are so strong here on the Wye, very powerful fights. A couple of times I thought the fish were heading off to Ross, as they headed for the shallows downstream. I lost a few fish to hook pulls but managed to land 14 nice barbel to around 8lbs and some cracking chub. Geoff and Danny both managed some nice fish too, I think around 4 or 5 apiece.